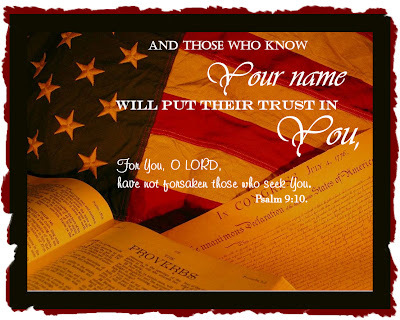 "And those who know Your name will put their trust in You, for You, O LORD, have not forsaken those who seek You." Psalm 9:10. There are stories everywhere about the state that our country is in. I can make myself crazy reading about it all. Can't you? This I know to be true: I'm not sure what our American economy holds but I'm confident in the One who holds the future and He has not forsaken His children! May God continue to bless you and keep you and may many come to know Him during this time of uncertainty in our country. They are looking for a saviour. May they find the One True Saviour who never forsakes those that seek Him! Please visit here for more Word Filled Wednesday inspirations. Yes, it can make you crazy to keep reading/hearing the shape things are in. I'm so thankful we have our precious Lord to hang onto, all the time. Aren't you glad to know that our circumstances are not defined by this world but by what the Lord decides? He is our strong tower. I don't even watch the news because it can just make me want to worry and not trust. Great post my friend. Amen! Our future is in HIS hands! I loved the picture behind the verse. Thanks! Love your new fall look! I am so thankful that God knows the future and holds it all in His hands. That nothing that is going on in our country and world is a surprise to Him. That He is here TODAY to hear our cries as we experience the trials of the economy and WILL supply our every need! HE IS GOOD! He is so faithful! Blessings and thank you for putting the verse to the awesome picture of our hope! Amen Kristi! Thank you for the verse. God bless! I try not to get caught up in that craziness, but stay in pray about it. Thank you for your WFW it is a promise that all Americans should cling to in these times. Indeed, He never leaves or forsakes us. I pray that we continue to seek Him each day! Happy WFW! What a great truth! I just love your blog! It screams happiness & joy...two very good things!! Happy WFW...blessings to you today, sweet one! This is a beautifully done Word Filled Wednesday and a good reminder...especially during election time. Even though we may disagree on who the right person is to be president, we can still trust that the one God has chosen will be the president! Oh yes, Kristi! So thankful that we have God's word to guide us in these crazy times. What a great post and an amazing WFW. I would love to use it for our ministry devotionals. BTW thanks for coming by this morning. Please come back next week because there will be a surprise for my fellow Texan waiting! I would love to use your verse. Please let me know if it is ok.
What a great and timely reminder today! I avoid "high drama" as much as possible and this certainly qualifies in the eyes of many. God is in control. I'm trusting Him who is faithful! Thanks for this beautiful scripture today! It can make you insane sometimes keeping up with it all. I have promised myself that after the election I am taking a news break, LOL! Praise God for the surety of His Word and His plans for us. I was thinking the very same thing this morning. Now more than ever we need to put our trust in the Lord. Well said! We just have to trust that God has a plan. I'm so glad the Lord knows what is going on and what is to come...Great post my friend. Thank you! These are scary times, so true. It's so good to know the Lord will take care of us though. Great post! I have saved it to use next week. I was thinking after I heard from you about putting a Mr. Linky on my post next week. I have been just indivdually asking people and have always got affirmative response. But I think the Linky might be easier for me. Thanks again for sharing your talents to help our teens. So true, everywhere if we pay too much attention to the vexations going around, we will go crazy...it's a comfort to know that God is around and will always be around for us. What a peace filled reminder. I know God has it all covered! I kinda had the same thoughts as you with my scripture too. Your blog is soooooooo pretty!! Amen! We may not know what the future but we are confident in the One who holds the future and He has not forsaken His children! This is my comfort too. Thanks for sharing this beautiful picture and encouraging verse. Thank you for your sweet and encouraging comment on my post. Take care and may the joy of the Lord be your strength always! Amen, what a timely and encouraging post to put our faith in God and God alone! Your blog looks great!!! Perfect for fall.